Reconsidering the Sugarcubes, with particular reference to the toilet habits of Henry VIII. Björk, I am reliably informed by my friends who hang around in coffee-bar franchises a bit less ubiquitous than Starbucks, recently brought a new album out, and I’m sorry to say I can’t get too "yay!" about the fact. I’m sure it will be fairly interesting and unusual in a generally accessible way, since Ms Gudmundsdottir is one of the few people who can make the cover of both The Wire and Q magazines. I’m sure the words “unclassifiable”, “bonkers” and “elf” dotted the reviews. And I’m sure it will be better than the most recent album by, to pluck a name, Dido. But I’m also sure it won’t be anything like as good as anything Björk did with the Sugarcubes. The Sugarcubes’ reputation has taken something of a mauling in recent years. They seem to have been relegated to a position somewhere alongside the Brilliant Corners and the Chesterf!elds in the 80s indiepop retrospective cool league, a posse of Nordic chancers who just happened to be sheltering a bona fide avant-something genius diva in their shambolic midst. It’s fair to say that they failed to build on the promise of their first album. But admit it, so did half the bands in your collection. 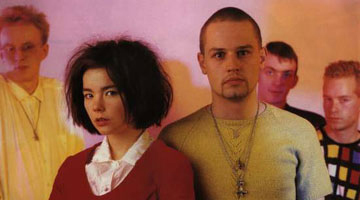 The Sugarcubes were initially special simply because they were Icelandic. At this point in the late 80s, it was not yet cool to own shares in a bar in Iceland, as Damon Albarn later did, and the only thing we knew about that odd bit of rock was that Magnus Magnusson came from it. I remember a brief fad - OK, I’ll come clean, it was a fad to which I subscribed like a starry-eyed cultist - always to refer to the band as Sykurmolarnir, and to insist that the original-language version of their breakthrough single was superior to the one that Janice Long played. Happy Amm-li To You, indeed. Life’s Too Good still stands up; Beefheart goes funky with a side order of pastoral whimsy. I always thought of the dark fairy tales that pepper the early work of Pink Floyd, but I didn’t know why, until the second album appeared. Here Today, Tomorrow, Next Week is a mangled quotation from The Wind In The Willows, which also provided the title for the Floyd’s only truly great (read: “the only one with Syd Barrett in charge”) album, The Piper At The Gates Of Dawn. But by this stage, the band had fallen victim to the retrospective on-one-matey law that ensured all guitar bands had to identify “a dance element in our music”. The skronk was oozed out, and they gradually became just one more kooky Eurosynthpop outfit, with occasional moments of whatdafuk!? genius: “Regina” on the second album; “Vitamin” on the third and last, Stick Around For Joy. The band still made for great journalistic copy: I don’t recall any of their contemporaries using interviews as a medium for discussing how best to eat puffins. But in the end they became identified as some professional loonies who formed a band as an amusing sideline. Rather like Syd, in fact, the mad myth swamped the music. I must admit, I’d given up by then. I didn’t even bother to look for an Icelandic-language version of the final album. Another thing that overshadowed their music was the soap opera nature of their personal lives, which essentially made Fleetwood Mac look suburban Puritans. Björk was originally married to guitarist Thor, with whom she had a child, but they split up, and he immediately married keyboard player Magga. Drummer Siggi and bassist Bragi, meanwhile, were married to twin sisters, although there must have been tension between these brothers-in-law-in-rhythm when Bragi pledged his troth in a gay wedding ceremony to his colleague Einar Orn. Ah, Einar, the supposed villain of the piece, Mr Toad incarnate, with his shoutings and his bad trumpetings, obscuring the majesty of Björk’s wibbly, ethereal trills. But to see him as the talentless party-pooper at the gates of dawn is to misunderstand his importance. The only time I saw the Sugarcubes live, an acquaintance of mine was taking photos from the balcony. Einar spotted her, and started climbing the curtain, like Errol Flynn hauling himself up the rigging in some 1930s pirate movie. As he came to eye-level with Susannah, he calmly pulled the camera from her hands, and proceeded to use up the rest of the film with pictures of her. Spontaneous audience/performer inversion in a quasi-Brechtian Verfremdungseffekt stylee! You see, Einar was a representative of a noble tradition. He was the supposedly useless additional member of the band who was, in some peculiar way, integral to the success of the unit. Think Andrew Ridgeley; Paul Rutherford; Richey Edwards; Bobby Byrd; Cressa; the tambourine player in Primal Scream and the bloke with the maracas in Gallon Drunk. And think of those bands, or the subsequent solo careers, after those alleged no-hopers departed. Or are you telling me that “Last Christmas” isn’t as good as whatever George Michael’s last single might have been? Einar was John Oates to Björk’s Daryl Hall; Sid James to her Tony Hancock; Tammi to her Marvin; Thing to her Wednesday Addams. These people are muses to the musos. They act as jesters, holy fools, the only ones permitted to speak the truth to medieval kings. They provide insanity and stability in equal measure. They are the descendents of the guy who hovered behind the Roman emperor on his triumphal processions, whispering in his ear “remember, mate, you’re only human.” They may even have Jungian links to “Groom Of The Stool” Sir Thomas Heneage, whose responsibility it was, according to Martin Amis, to wipe the bottom of King Henry VIII with a damp cloth, a sort of walking, talking Tudor bidet. I only mention this because Björk (according to that Pepys de nos jours, Popbitch) once crippled the plumbing at a reputable London club with the size of her jobbies. Which could lead us back to a cheap, scatological shot at the expense of Björk’s latest album, but no. I’m sure it’s very nice, but I won’t be buying it. At least, not until they release it in Icelandic, with Einar on bad trumpet.